In the very early hours of 31st January 1968 gunshots started to sound out in the area of the United States Embassy in Saigon, South Vietnam. As it got light many more residents were woken by gunfire in hundreds of towns and urban areas throughout the southern part of divided Vietnam. The 30th was the Eve, the 31st the actual day of Tet, the Vietnamese New Year. Those gunshots sounded the beginning of what was probably the most decisive single military event in the undeclared war that the US waged against a small peasant country in South East Asia and which presaged the grim future for the invaders. Those gunshots sounded the beginning of the Tet Offensive. The Tet Offensive was the name given to the offensive and general uprising that began on the night of 30th/31st January 1968. 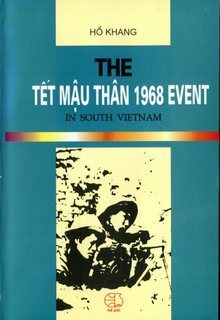 In Vietnamese it is Sự kiện Tết Mậu Thân 1968 – literally the 1968 Tet Event. ‘For nearly two months, this campaign, like a tidal wave, attacked four out of six big cities, 37 out of 44 towns and hundreds of district capitals’. The first attack was made in Saigon at about 02.30 on the 31st when a small group of Viet Cong, irregular guerrillas living and working in the south of the country, blew a hole in the wall of the compound of the American Embassy in Saigon and for the next few hours engaged the Marines charged with the task of defending the iconic building and symbol of American force within the southern capital. By daylight 19 attackers and seven Americans lay dead. This was probably the only time during the whole of the uprising where there is agreement on the number of fatalities. At first the Americans, including the Commander in Vietnam, General William Westmoreland, thought this was a one-off event, an adventurist, opportunistic, ‘terrorist’ attempt by desperate guerrillas to take a swipe at the US presence in their country. Then reports started to come in from Saigon airport, then various areas within the city, then other cities, then other towns, then hundreds and hundreds of other locations throughout the country where American and South Vietnamese collaborationist power was under attack. US supported South Vietnamese rule was being challenged and attacked on every level; military bases were under attack, as were administration buildings; various military and government officials who were helping in the occupation of the country were being targeted; the transport and communications infrastructure was being attacked and disabled, making response to the uprising more difficult to organise; armaments stores and other resources were destroyed and, perhaps most important of all, the Vietnamese resistance was on the streets of the urban areas carrying out all this mayhem when the general belief of the Americans was that they could only operate in the countryside and in the jungle areas. The other shock to both the military on the ground in Vietnam and the politicos back in mainland United States was that they had been telling themselves, the world, and the Vietnamese Liberation Front that the Americans were winning. Since the back-end of 1965 the Americans had been following a policy of ‘search and destroy’. This basically depended upon the superiority the Americans had in technology, resources and armaments. They would go out in force, either on land or in the air, destroy anything that moved and thereby win the war. Sheer power would destroy the opposition and it would be light on US casualties as there would be distance between the targets and the US technology. This was why it became normal practice for helicopter gunners to just shoot at anything that moved on the ground, more often than not poor peasant farmers, or their draft animals, trying to eke out a living from the soil. Those events, often depicted in Vietnam War films, actually happened! And, it should never, ever be forgotten that massacres such as that at My Lai (which was to occur on 16th March 1968) were taking place on a regular basis. The Americans had been saying that they were forcing the guerrillas and regular North Vietnamese Army out of the south of the country, making it more and more difficult for them to challenge the rule of the puppet regime in Saigon and the puppet master. Apart from anything else they believed their own propaganda and intelligence sources – which might well have been feeding them what the North Vietnamese and the Viet Gong wanted them to believe. And then the guerrillas were everywhere, organised, well armed and with a strategy of what they were doing. And not only in the urban areas of South Vietnam. The siege of Khe Sanh. I said the first shots of the offensive were fired in the early hours of the 31st January. That’s not strictly true. At dawn on the 21st January, ten days earlier, North Vietnamese long-range artillery began shelling the mountain top base and airstrip of Khe Sanh – a place very few people in the US had even heard of. On the first day more than 300 shells landed on this base, merely half a mile long and a quarter of a mile wide. The American Marines had been there for just under a year and before they realised it, even with all the modern technology that the US possessed at the time, the base was effectively surrounded and could only realistically be reached or provisioned by air. The whole, relatively short story of Khe Sanh probably deserves a post in its own right but in relation to the Tet Offensive there are a number of points to stress. In a sense the attack on the 21st can be seen as a distraction from the forthcoming uprising. Obviously the Americans would have been asking themselves why they had missed such a massive build up. Not only had the North been able to transport anything up to 20,000 fighters, with their equipment and a supply line that could keep them fed and cared for, they had also been able to transport heavy artillery (and even tanks that were used later during the siege of the base) and thousands of artillery shells. All this travelling hundreds of kilometres very often on nothing more substantial than a push bike. That took a huge amount of forward planning and was far too much just to create a distraction. There was more behind the siege than that, although the distraction was an added bonus. The US response to the siege was similar to their failed policy of ‘search and destroy’ – committing almost unbelievable amounts of resources into air raids on the ground where they thought the Vietnamese might be found. At one point there were 400 plus sorties A DAY. This included B52s dropping 500 pound bombs that no one knew were on the way until they landed, the planes themselves flying so high, and Phantom jets firing missiles and/or dropping napalm, effectively creating a lunar landscape. It failed. Although many of the commanders had fought in WWII they still didn’t seem to have learnt the lessons of Monte Casino in Italy or Okinawa in Japan. At the beginning of April the Vietnamese started to leave quietly. One morning the Americans slept in as there were no shells giving them a wake up call, the base was relieved and then, within a matter of days, abandoned. They feared another Dien Bien Phu debacle of 1954, they left just in case it should happen in the future. Khe Sanh had shown them what they would have to face. Tet in Saigon, Hue and entrenchment. I can understand, and appreciate, many of the actions of the Vietnamese during the Tet Offensive but questions come to mind when Saigon, Hue and a few other locations are concerned. Guerrilla warfare (and this was a theory developed by Chairman Mao Tse-tung in the war against Japanese Aggression and then the Civil War against the Kuomintang before 1949, later taken up in a masterful manner by General Vo Nguyen Giap in Vietnam) is where the liberation fighters use their strength – knowledge of the terrain, being part of the people, mobility, ability to strike quickly and then disappear – against a superior enemy, but superior only in that they have greater access to war materials, technology and a very deep pocket to pay for it all. But the enemy’s strength is also its weakness. It’s totally dependent upon a sophisticated supply line which, in certain circumstances, can be isolated and then such a force basically dies of its own ‘strength’ – this was what happened at Dien Bien Phu to the French invaders in 1954, both a military and psychological defeat which saw the end of the European presence in Indochina. Such a problem doesn’t exist for a guerrilla army which can just melt away as the only equipment they have can be carried or easily hidden. This also means that there’s no necessity for the guerrilla army to entrench itself into a fixed position – which seems to be what was planned in Saigon and even more so in the historic city of Hue. After the initial skirmishes in Saigon a force of about 4,000 guerrillas ended up in the Chinese neighbourhood of Cholon. Soon fighting was on a block by block, house by house nature. Initially the much more heavily armed American and Army of the Republic of Vietnam (ARVN) tried to take control of the area in conventional, house to house fighting. This was, after all, their major city and the capital of South Vietnam. The world press were looking on and they had to keep up appearances. However, after a few days of fighting and mounting casualties the Americans declared the area a free fire zone and ordered all civilians out of the neighbourhood. Despite that and with all the resources at their command it wasn’t until 7th February that the US and South Vietnamese government forces could say they had ‘complete’ control of Saigon again – after a number of the Viet Cong had silently left the area. Here I don’t know why the North Vietnamese committed so much resources into a set battle they could not possibly win in 1968. By 1975 the situation was completely different and then ‘conventional’ warfare was an option. But at the beginning of 1968 they did not have the ability, either militarily or psychologically, to defeat the Americans and their lackeys. The same question can be asked about why Hue was considered to be so important as to devote the greatest number of combatants from the start of the uprising and was even reinforced by troops from Khe Sanh. Thousands of the bravest and patriotic sons and daughters of the country were fighting in a battle that they didn’t need to fight and they could have been withdrawn to fight another day, when the chances of victory were greater – that, surely, if nothing else is the most important lesson of guerrilla warfare? It’s when that lesson has been ignored, on too many occasions in the last 70 years or so, that things go wrong and not only battles but wars have been lost. Well into February the NVA were able to move more fighters and material into Hue. They should have done exactly as they were later to do at Khe Sanh – just up and leave one morning. As it was by the 24th February, when the Citadel in Hue had, once again, the flag of the South Vietnamese puppet state flying from its ruined ramparts, many hundreds of Vietnamese patriots lay dead, although, as in Saigon, many had managed to leave in the heat of battle. Whatever the reasoning of the North Vietnamese for their positional warfare over a period of five to six weeks there was no doubt about the US response to such a situation on the ground – that is to destroy all, whatever might be in the way, to, hopefully, kill the enemy. The US decided that it would use its ‘advantage’, wealth, technology and overwhelming military power, to obliterate the enemy, whatever it might cost. What was said about the total destruction of Ben Tré, a small town to the south-west of Saigon, ‘we had to destroy it to save it’, became the axiom of American response then as now, as the people of Iraq, Afghanistan and Libya (among others) have learnt to their regret. Also, as another indication of American hypocrisy and duplicitous thinking, in made no difference if that destruction was to concern anything that had cultural value to either the country or the world’s population in general. The ancient and historic Citadel in Hue barely had a wall strong enough to plant the ‘victorious’ South Vietnamese flag on the 24th February. Mỹ Sơn, the longest inhabited archaeology site in Indochina, was devastated by B52 carpet bombing in a single week in August 1969. This was only to presage the irreparable damage done to the library and the looting of the museum in Baghdad in 2003 when the US, yet again, decided it had the right to invade a country to protect its interests. And now they criticise Islamic State for its deliberate destruction of the archaeological site of Palmyra in Syria. Summary execution of the streets of Saigon. It was in these early stages of the fighting that an incident took place in Saigon which was to define the nature of the war. 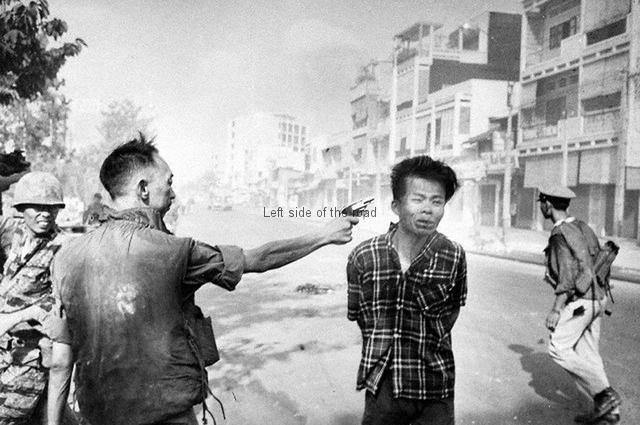 On 1st February a Viet Cong officer, Nguyễn Văn Lém, was summarily executed, on camera, in the streets of Saigon by the Chief of the National Police, Nguyễn Ngọc Loan. International lawyers might waste everyone’s time in debating the ‘legality’ of this execution and excuses can be made for the murderer, i.e. he was upset at what he believed Lém guilty, but it demonstrated the nature of the conflict. The US and their puppets would do anything to make sure they maintained their power. There’s no doubt that the Vietnam war – especially that part of it with US involvement – was a ‘no holds barred’ affair. However, it’s the hypocrisy that emanated from the Americans at the time (and still to this day in whatever conflict they might be involved) that they are the ones who maintain and hold the moral high ground. The falsity of that claim is proven by the farce of the ‘trial’, sentencing and then pardoning of those involved in the My Lai Massacre (which was to take place within a matter of days after the ‘end’ of the Tet Offensive) or more importantly the fact that many other villages suffered such a fate and those details have never been fully reported. What happens on the battlefield is not always the same as what has happened when there’s a review of the battle. Whatever the fine words and the emphasis on the body count of the Vietnamese patriots (which was far too high) it’s pushing things for the Americans to argue that they ‘won’ the conflict militarily. Wars don’t just end, even when there might be a significant battle towards the end of the conflict. That loss can normally be traced to some event in the past which meant that, however far down the road, defeat was inevitable. As with the battle of Stalingrad the defeat of the Hitlerite Fascists was inevitable – all that was in doubt was when. Tet played that role in Vietnam. To start with it was a total intelligence disaster for the Americans. They knew there ‘was more activity than usual’ from the end of December but nothing that suggested a nationwide, co-ordinated and strategic attack; nothing that gave any indication of the sheer amount of movement of personnel and materials; nothing that would be so significant that, whatever the political leanings of the commentators, it would shape the future of American involvement in Vietnam and, if it hadn’t been accepted before Tet it certainly was after, that the Americans could not win. In this intelligence disaster it is rarely stated that although the US and its lackeys didn’t know what was going to happen, a sizeable proportion of the Vietnamese population obviously did – if not the exact details they would have known something very big was in development. That’s not a real surprise. The Viet Cong were of the people and lived among them. There will, in any such situation, be collaborators, traitors and plain opportunists but it would not have been possible for the offensive to have been so extensive if it were not for the co-operation of many and the acquiescence of many more. What is particularly notable here is that many of those people who basically kept quiet would have been members of the South Vietnamese political infrastructure as well as the relations, and members, of the Army of the Republic of Vietnam. Yes, they could spend billions of dollars, send thousands more young Americans to be killed, injured, traumatised in Vietnam. Yes, they could kill many hundreds of thousands of poor peasants, destroy what infrastructure existed in both the North and the South. Yes, they could feed the military/industrial complex money that could be better spent on projects helping those in need at home. Yes, they could eventually argue, which many still do, that they didn’t really lose the war – although crowds fighting to get on to helicopters on the roof of the embassy building in Saigon, at the end of April 1975, those helicopters then being dumped into the South China Sea afterwards as there was no space for them on the ships sent to aid the evacuation – seems to be a somewhat undignified manner to get out of a conflict they had been directly involved with for almost 25 years. And anyway, how can you lose a war that wasn’t declared in the first place? After a post-mortem of the offensive, carried out by Clark Clifford, who was to take over as the new Defence Secretary from Robert McNamara at the same time as Tet was over, he realised that the Americans had ‘no military plan to win the war in Vietnam’. It’s astounding that such a high-ranking official in Johnson’s administration could make such a statement after the US had been meddling in Vietnamese affairs since the early 1950s. It’s even more astounding that the war was to carry on for seven more years, with all the death and destruction that went with it – on both sides. Tet basically ended Lyndon Johnson’s political career – and probably shortened his life. At the New Year (Western style) he was anticipating a second full term at the White House, a victory in the US mirroring what they thought was greater success in the foreign war. He, and virtually all around him, had listened to and had believed their own propaganda – a dangerous thing to do. When you make statements for public consumption make sure you don’t con yourself in the same way as you seek to con them. On 31st March 1968 he made a televised speech which began with ‘I want to speak to you of peace in Vietnam’ and ended by making the statement ‘I shall not seek, and I will not accept, the nomination of my party for another term as your President’. He did keep to his word about the Presidency but peace was to take another seven years before it knocked on the door of the Vietnamese. The US commanders, especially Westmoreland, argued to his dying day that the Americans and their puppets had won Tet militarily. If the question is asked in the sense of who was it that was the most powerful force on the battlefield after Tet it might be true. But to ‘defeat’ the partisans the Americans had to create a wasteland, where everything was destroyed, where when the fighting stopped the people had nothing to return to but rubble. This was shown most clearly in Cholon (Saigon), Hue and the town of Ben Tre. The idea of ‘if we can’t have it neither can you’ permeated US imperialist thinking then, for the rest of the Vietnam war and into the present, 21st century conflicts. In Vietnam, after Tet, the level of bombing increased – more bombs being dropped on Vietnam, in the ten years from 1965-76, than were dropped by ALL the belligerents in the Second World War; napalm and agent orange (a powerful defoliant) were used to deny the Vietnamese cover in the forests and jungles; and thousands and thousands of anti-personnel mines (especially brightly coloured ones aimed to attract children) were dropped to make daily activities a life threatening experience. ‘Destroy it to save it’, ‘better dead than Red’ was the motto then – and now. The ‘psychological effect’ and the role of the media. But military success, whatever that might mean, is not the only thing that’s necessary for winning a war. The psychological aspect has become even more important in the age of fast communication. The conflict in Vietnam was considered to have been, probably, the most photographed and filmed war of the 20th century. Images of dead and wounded soldiers being shown on television within hours of it happening was something that had never occurred before. There were also a number of images that seemed to define the conflict – and in all these the Americans and their allies came out in a bad light. Apart from the summary execution of Nguyễn Văn Lém (mentioned above) there was that of Thích Quảng Đức, a Buddhist monk who burned himself to death on the streets of Saigon on 11th June 1963 (in protest at the activities of the Ngô Đình Diệm government of the US puppet regime at the time) and that of Phan Thị Kim Phúc, a nine year old girl photographed running naked along a road, with other villagers, after a US air force napalm attack on 8th June 1972. Westmoreland constantly harped on about the media being one of the causes of the US withdrawal from the conflict and the growing opposition to the war back home in the United States. He would have preferred the world to have only heard the stories that had been produced by the US propaganda machine, copies of ‘Stars and Stripes’ – the internal army magazine – dropping through everyone’s letter box. But even if the US had been able to control the dissemination of news they couldn’t have hidden the almost 60,000 black body bags that were returned to the United States. However, ‘freedom of the press’ has been restricted in subsequent imperialist wars, firstly in Britain’s shameful war in the Malvinas (1982). Then, as now in the increasing number of conflicts of the 21st century, journalists, photographers and film crews are ’embedded’ with the invading troops. Such a situation both restricts their movement and also creates an environment where they actually get to know the soldiers on the ground and will be more reluctant to report stories that would place them in a bad light. And, of course, anyone selected would undergo a strict vetting process, so they would be less likely to report unfavourable news in the first place. In terms of casualties on the North Vietnamese and Viet Cong side I know of no exact figures, but they would have very much outnumbered those of the enemy. Hà Văn Lâu, a military commander against the French and later a diplomat said, in the Canadian made documentary, ‘Vietnam: The Ten Thousand Day War’ (1980), that the high cost in personnel and materials ‘was the price we had to pay to win this strategic victory’. That is both true and not. Throughout history there have been many who have been prepared to die for the liberation of their country. Mao’s theory of guerrilla warfare gave an ideology to those struggles and a way forward that offers better chances of success. However, I would be happy to see a return to the situation where it is the enemy who takes the brunt of the pain and more workers and peasants are around to see, to celebrate and to benefit from the final victory. However, I agree that the strategic aim was achieved; the National Liberation Front had shown that it could effectively take the combat to the US and its puppets in the cities; they proved they had the organisational infrastructure to carry out such activities; they had shown the enemy something of their potential for the future; they had given hope to those having to live under the neo-Fascist regimes in Saigon and the occupation of the country by a vicious, imperialist military; they had proven that they could defeat the invader in certain circumstances; they had broken the enemy psychologically; and they had made the first moves to eventual victory. When was Tet in 1968? Researching this article I became confused with what seemed conflicting information. It was only when I read something about the changing of the date of Tet that light was shone on the issue. At the end of 1967 the government of North Vietnam decided that Tet in 1968 would fall on 31st January. This was an adjustment to the calendar which did not happen in the South. So when there was an order that the offensive would start on the Eve of Tet there was some confusion in certain parts of the country. This could have been disastrous in other circumstances. In 1968, however, this confusion acted to benefit the insurgents as attacks were made in the more marginal urban areas and this had the effect of disguising the attacks that were to take place in the likes of Saigon and Hue. Nonetheless, it seems to be a risky business to change a calendar, no matter the justification, of a particular festival when you were planning a major military event for that very day. It seems there was a slight communication problem within the government departments in Hanoi. I have chosen the North Vietnamese day of Tet for the title of this post. 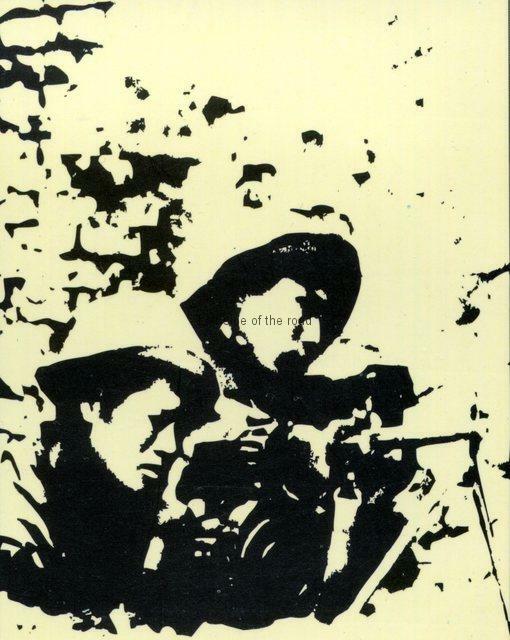 ‘The Têt Mâu Thân 1968 Event in South Vietnam’ by Hô Khang, Thê Giói Publishers, Hanoi, 2001. This is the only account of the event that I have encountered written from the Vietnamese perspective that is available in English. It should be remembered, however, that by 2001 Vietnam had turned away from the road of Socialism and was storming along towards the full embrace of capitalism. The 30th January marks the 368th anniversary of the execution of Charles Stuart, the ‘tyrant, traitor, murderer and public enemy’, who had claimed to rule what later became known as the United Kingdom by ‘divine right’ – that he was chosen by the Christian God and therefore could do what he wanted. In defending his right to absolute power he caused destruction to rain on his country, causing death and suffering in an unprecedented scale on the general population. Executions, and public ones at that, were not rare occurrences in England in the 17th century, but it wasn’t normal to decapitate those who had ‘been anointed by God’, although those individuals in previous centuries had had no reluctance to do so to others who might have displeased the Royal authority. However, Charles Stuart was the first king to face such a fate and be executed through the authority of the people. The propaganda machine behind monarchies worked hard through the centuries to give kings – who were basically leaders of the most successful gangs of thugs, murderers, rapists and thieves at a particular time – an element of legitimacy that still exists to the present day. In Britain present day royalists loudly proclaim that the UK has the longest, unbroken line of monarchy in the world. This conveniently forgets that from the time of the first king (who might be Egbert in 827 or Alfred the Great in 871, depending upon whose authority you believe) this line is not from the same family – as it is popularly and misguidedly believed. Gang leaders fell out and ended up killing erstwhile friends and allies; invaders from other parts of Europe came in wanting a slice of the action; wars raged across the country for decades as different pretenders to the throne slugged it out, until one of them lay dead in the mud of the battlefield; at times ‘kings’ were invited in by minor gang leaders as the only way to avoid more costly and fruitless internecine strife; one time the ‘chosen’ one was number 54 in line of succession, all the ones with a lower number being Roman Catholics – so in place of choosing someone based on merit the eventual candidate got the job merely because he wasn’t a ‘Papist’; at one time the royal family had to change its name from Saxe-Coburg and Gotha to Windsor as they feared the young soldiers being sent to live (and many to die) with the rats in the mud, water and noise of the trenches in France, fighting against likewise ill-fated German workers, might wonder why the King they were dying for had a German name. Charles Stuart was the son of one of those monarchs brought in when a space had to be filled. When Stuart failed in his many attempts to get his own way he ran away from London and then, when he was able to collect around himself enough armed toadies, he instigated the First Civil War, 1642-46. As we know from any cursory study of history civil wars are particularly pernicious and tend to be more costly in terms of casualties and last longer when inter-State wars would look for a way out, or at least a truce for a short time before starting again. That was the case, more or less, up to the 20th century when all common sense seemed to drown in the water-filled shell holes of the Western Front. Civil Wars tend to divide communities and this means that revenge comes into the equation when cities and towns change hands following the fluctuating fortunes of the two sides involved. The Royalist had a few success but ultimately were defeated in May 1646. Stuart was imprisoned and it was suggested to him by the Parliamentarians that he accept the imposition of a Constitutional Monarchy – where he could sit on the throne but which would require him to renounce his ‘divine right’. His arrogance meant that he would never accept such a situation and was obviously given too much freedom during his captivity and although still technically in the hands of his enemies was able to communicate with those followers who had not been eliminated and this resulted in the Second Civil War – a shorter conflict than the First not least because many Royalists refused to break their parole (an agreement not to take up arms against Parliament in return for their freedom to live a normal life). Stuart broke his parole and was therefore not trusted by many Parliamentarians and this inevitably led to his trial – a novel idea at the time. After the fighting ended Stuart was imprisoned in Hurst Castle in Hampshire whilst his ultimate fate was decided upon in London and at the end of 1648 he was escorted by Major General Thomas Harrison, of the Parliamentarian Army, to be closer to the place of his trial. There will forever be a debate of how many people actually suffered during the two civil wars for which Stuart was being held responsible – all depending, in many senses, on which side of the Monarchist/Republican fence you place yourselves. After all, during the period in question such statistics were not considered in the same way as they are now and the disruption caused by the very nature of the conflict would have meant that even the best intentions in information collection would be thwarted. Any figures would also vary depending on whether only military casualties are considered or whether the greater picture is taken into account. At the beginning of the 17th century a huge swathe of the population would have been living an existence barely more than subsistence. Such a condition needs very little to push that subsistence into outright starvation. And starvation leads to susceptibility to disease. Marauding armies crisscrossing the country would play havoc with agriculture which, remember, was still based on the unproductive and wasteful feudal strip system. Any draft animals would be requisitioned by the armies and surpluses, if achieved, under threat of being stolen by hungry, armed men. Trade would have virtually ceased to exist, even in the locality, as fear of marauders and a poor transport infrastructure would keep people very much at home. As well as that many able-bodied men would be actually fighting instead of working on the land and their deaths or serious injury would have an impact on the rural communities long after the fighting stopped – and the Royalists kept on coming back with more death and destruction – even after the death of the war criminal. And that was what Stuart was accused of being. He instigated the conflict as a significant proportion of the country wouldn’t play the game by his rules. He refused to accept reality and used the sycophancy and toadyism that always accompanies the monarchy to gather around himself a significant military force. As consequence something like 860,000 men, women and children died – of a population of seven million (in England, Scotland, Wales and Ireland) being about 12% of the population, more than any other conflict before or since. When that level of death and destruction occurred in the 20th century the Fascist perpetrators in Germany and Japan were held to account and tried, convicted and sentenced. Stuart faced his Nuremberg 296 years before the Nazis. If someone was guilty of such crimes today the international community would be branding him/her a ‘war criminal’ guilty of ‘crimes against humanity’ (as long as the individuals concerned were not citizens of the United States) and demanding that s/he face judgement at a special tribunal of the International Court of Justice located in The Hague, Netherlands. If seems strange, therefore, that some people cast aspersions upon the legitimacy of the trial that took place in London in January, 1649. Maintaining his arrogance Stuart refused to recognise the jurisdiction of the court and constantly referred to his supposed ‘divine right’. Faced with overwhelming evidence he was found guilt and sentenced to death on 26th January. The orders for the execution to take place on Tuesday 30th January were signed and sealed the day before. Whereas Charles Steuard, Kinge of England is and standeth convicted, attaynted, and condemned of High Treason, and other high Crymes: and sentence upon Saturday last was pronounced against him by this Co[ur]t, to be putt to death by the severing of his head from his body; of w[hi]ch sentence, execuc[i]on remayneth to be done; these are therefore to will and require you to see the said sentence executed in the open streete before Whitehall, uppon the morrowe, being the Thirtieth day of this instante moneth of January, between the hours of tenn in the morning and five in the afternoone of the same day, w[i]th full effect. And for soe doing this shall be yo[u]r sufficient warrant. And these are to require all officers, souldiers, and other, the good people of this Nation of England, to be assistinge unto you in this service. Given under o[ur] hands and seals. To Col. Francis Hacker, Col. Hunks, and Lieut-Col. Phayre, and to every of them. 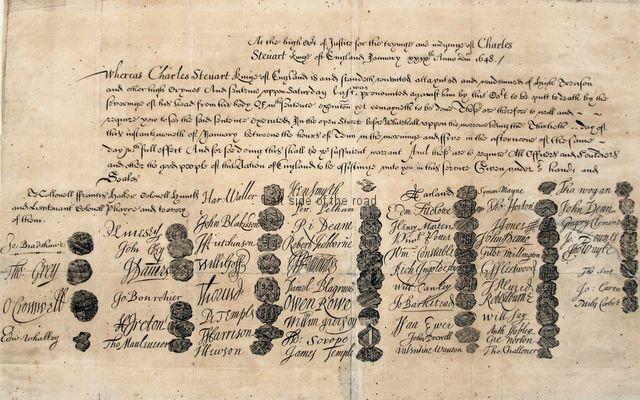 Underneath were 57 signatures and seals of the Commissioners (those who sat in judgement) – some signatures were over erasures, so some of them were cowards and couldn’t deal with the seriousness of the crime of which Stuart was convicted. Then, as almost certainly would be the case in a similar situation now, the insidiousness and perniciousness of the tradition of the monarchy being different from us mere mortals playing a role in that decision. Just before 14.00 on the afternoon of the 30th Stuart walked through the space provided by the removed window on the first floor of the Palace of Westminster on to a specially constructed scaffold. He was accompanied by the same Thomas Harrison who had brought the war criminal from Hurst Castle the month before and would have been the last person with which Stuart would have talked. Stuart’s head was separated from his body by one sharp blow – so a professional was used, the identity of whom is still not definitively known. Such was not to be the fate of those 57 signatories still alive in 1660 when the monarchy was invited back to be a parasite on the body politic of the British Isles. 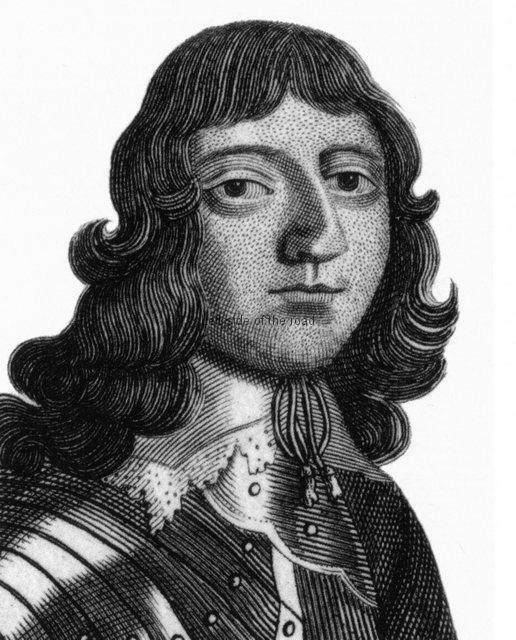 In the discussions with Stuart’s eldest son, also named Charles there was an implied agreement that there would be no retaliation to those who had signed the death warrant of the father, being, as they were, merely servants of the people. When the new king had his feet under the table (and before he started his whoring and followed his favourite hobby of collecting mistresses) he started the process of extracting vengeance on the regicides. The first to suffer at the hands of the vengeful spoilt brat was the very Thomas Harrison who had accompanied Stuart Elder to the scaffold. But Thomas didn’t get the quick death afforded the war criminal. His punishment was to be hung, drawn and quartered. This process, which had been around since the early part of the 13th century, had fallen into disuse during the time of the Commonwealth (from 1640-60). Rather than being hung with a drop that would break the neck the victim to be executed was dangled at the end of a rope, being throttled rather than hung. Just before loosing consciousness he (it was always a he, women liable to such punishment (that is, the crime of high treason) were merely burnt at the stake – for the sake of ‘public decency’) would be cut down, castrated and then shown the package, In the case of Thomas his abdomen was slashed open and molten metal poured into the wound. (At this point Thomas lashed out and hit his murderer who then immediately cut off his head – which seems to be a strange sort of punishment but was probably caused by the current level of ignorance and fear that a ‘dead’ man was able to react in such a manner.) The entrails would have been thrown into a nearby fire, his head cut off and the body hacked into four pieces, the separate five pieces then being distributed around the city of London, as a warning to others. The Royalists even took out the revenge on the dead, exhuming those who had died before 1660 and hanging the rotting copses from cages in various parts of London. Cromwell’s severed and preserved head even appearing in fairgrounds way into the 19th century. 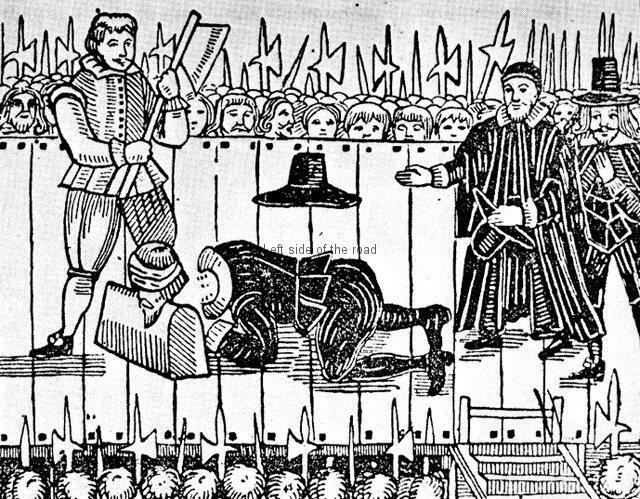 Hanging, drawing and quartering was the punishment for high treason so Stuart could quite legally have been submitted to such treatment. This form of torture existed in Britain until 1870. At least Thomas died with dignity, the same couldn’t be said of the others in the country who had fought against Stuart but then kowtowed to the new monarch that was installed on the throne in 1660. They might have dies peacefully in their beds but they died as forelock-tuggers, sycophants and gutless cowards. No one should really have been surprised that the agreement before the Restoration wasn’t honoured. Way back in 1381 Wat Tyler, one of the principal leaders of the Peasants Revolt, met with the boy Richard of Bordeaux. Trusting the monarchy was to be Tyler’s last act as he was treacherously stabbed in the back by William Walworth, the Mayor of London, and then hacked to pieces by surrounding soldiers. The revolt didn’t last long after that. The lesson that should have been learnt then was ‘never trust the monarchy’. An interesting aspect of the picture at the very top (a contemporary painting of the event) is the image of the fainting woman. When revolutions break out there’s no way anyone can foretell how events will develop. This realisation didn’t exist in the 17th century as such popular uprisings were few and far between, peasant revolts being the only benchmark. Unfortunately, after many more recent workers led revolutions many still don’t understand that ‘a revolution is not a dinner party’ (Mao Tse-tung), that things happen that have never happened before and that a revolution can eat its own. So events like the execution of a monarch can happen. However, there was a kind of evolution in people’s thinking when the next European king was to lose his head. Women fainted in 1649, they knitted in 1793 when Louis Bourbon had an appointment with Madam Guillotine. The immediate political fallout of Stuart’s execution was that the English Revolution lost its momentum and direction. There wasn’t a formed ideology before the First Civil War started but once the people had taken on the established order, and especially the monarchy and the whole concept of ‘divine right’, this encouraged a flowering of ideas and debates. The Levellers, who were probably most influential in the couple of years between the first and second civil wars, argued for what is implied in their name. They wanted a more equal society, with equal participation of those who had previously been marginalised, by both the monarchy and Parliament – which itself represented land owning interests. Many of the young men who joined the Roundheads (the name given to Parliament’s army) were apprentices from the towns. They were given arms and training, had seen parts of the country which without the war would not have happened, were mixing with people who they never would have met in normal life and started to think. But thinking is dangerous and the ruling class doesn’t want the workers to do anything so dangerous. Soon after the execution Cromwell, who had become the most powerful general in the army due to his successes against the Royalists, had become virtual ruler of the country in Stuart’s place. (Just as it used to happen in Rome.) A mad Puritan – Protestant fundamentalist – he had a hatred of Catholics and there were a lot of Catholics in Ireland who he saw as a potential threat. He planned to send an expeditionary force to Ireland but parts of the army, those parts where Leveller influence was the greatest, refused. After all why had they fought tyranny to become tyrants themselves in another part of the British Isles? A group of soldiers mutinied and ended up being surrounded by troops loyal to Cromwell in the Church in Burford, Oxfordshire. Three of their leaders were executed, whilst the rest looked on, on 17th May 1649. This was the virtual end of the Leveller movement. At about the same time the Diggers (sometimes called the True Levellers) perhaps a more radical group of activists, inspired by the almost poetic writings of Gerrard Winstanley, occupied common land on George’s Hill, in Weybridge, Surrey. This experiment was crushed, yet again by troops loyal to Cromwell, the working class always being the ones who trample on movements that seek to take the whole class out of the mire in which they live. For a short period of time in the 17th century the English had got up off their knees and could have improved their lot if they but had the courage. 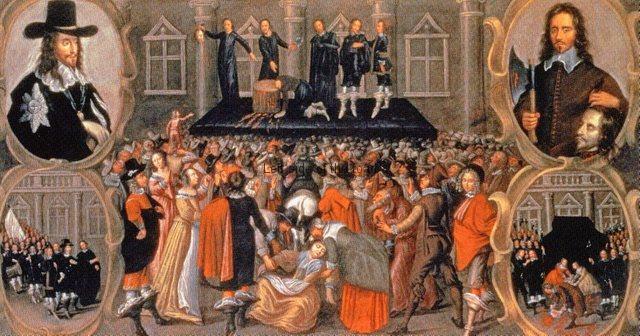 The execution of Stuart in 1649 seems to have made them dizzy and they knelt down again, only periodically getting off their knees over the next 400 years, but never for long enough to change society.